A store-bought barbecue sauce could be used if you don't have the time to use the one in this recipe. When using bottled or canned sauces make sure you go high quality. Saute onions, celery, bell pepper, and parsley in peanut oil until the onions are clear or tender. Add garlic and cook a little longer. Add steak sauce, hot sauce, and ketchup. Add salt to taste. Add Southern Comfort. Bring to a boil. Lower heat and cook for 2 to 3 hours. Makes about 3/4 gallon. This will keep in the refrigerator for weeks. Slice 1 lb. 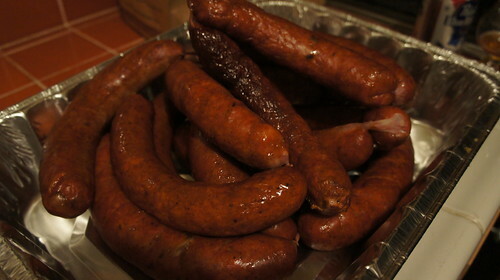 andouille or smoked sausage 1/4 inch thick and combine with 1 cup sauce. Heat well on stove or in a chafing dish. Serve with small pieces of French bread or use teethpicks to spear andouille.